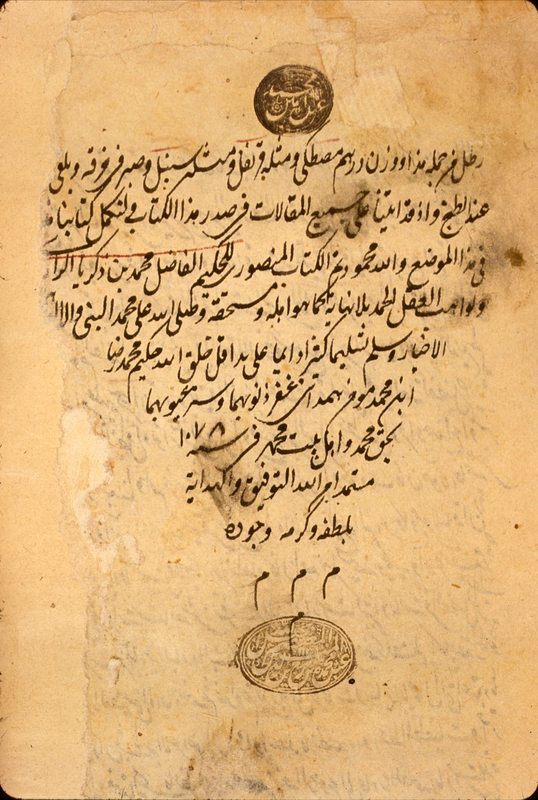 One of the works fundamental to the organization of medieval medicine was written by Abū Bakr Muḥammad ibn Zakarīyā’ al-Rāzī (d. 925/313 H), known to Europeans as Rhazes or Rasis. His Book of Medicine for Mansur (Kitāb al-Manṣūrī fī al-ṭibb) was dedicated in 903/290 to a local Iranian prince named Abū Salih al-Mansur ibn Isḥāq, governor of the town of Rayy near present-day Tehran. This work is a relatively short general textbook, comprising just nine chapters (maqalahs) or books, but it was very influential throughout the Islamic world as well as in Europe. The treatise was translated into Latin in Toledo by Gerard of Cremona (d. 1187 AD) and was known as Liber ad Almansorem. It became one of the most widely read medieval medical manuals in Europe, and the ninth chapter, on therapeutics, frequently circulated by itself under the title Liber nonus ad Almansorem. In the Renaissance many editions of it were printed with commentaries by the prominent physicians of the day, such as Andreas Vesalius. For other copies of Rāzī's Book on Medicine for Mansur, see Ullmann, Medizin, p. 132; GAL vol. 1, p. 234 (269), GAL-S, vol. 1, p. 419; and Sezgin GAS III, p. 281-282; Ghada Karmi, "Notice of Another Manuscript of al-Rāzī's Kitab al-Mansuri," Journal for the History of Arabic Science, p. 88-90, vol. 3, 1979; F. Maddison and E. Savage-Smith, Science, Tools & Magic (London: Azimuth Editions and Oxford: Oxford University Press, 1998), vol. 1, p. 31, no. 6 (Khalili Collection, MSS 329 copied in 1271/670 H); and Savage-Smith, "Bodleian", MS Marsh 248 and MS Hunt donat. 31. There is no modern translation or edition of the entire treatise. The chapters on kidney and bladder stones have been edited and translated into French by P. de Koning, Traite sur le calcul dans les reins et dans la vessie par Abū Bakr Muḥammad ibn Zakarīyā’ al-Rāzī (Leiden, 1896). The anatomical portions were printed (based on Paris, MS arabe 2866) and translated into French by Pieter de Koning, Trois traites d'anatomie arabes par Muhammad ibn Zakariyya al-Rāzī, ‘Ali ibn al-‘Abbas and ‘Ali ibn Sina (Leiden: Brill, 1903; reprinted Frankfurt: Institut fur Geschichte der Arabisch-Islamischen Wissenschaften, 1986), p. 2-89. A portion of the chapter on anatomy from Rāzī's Book on Medicine for Mansur, with a diagram of the ventricles or cells of the brain. 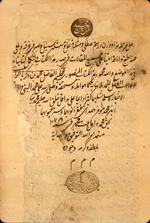 The colophon of the copy of Rāzī's Book on Medicine for Mansur, finished by the scribe Ḥakīm Muḥammad Riḍā ibn Muḥammad, known as Hamdānī, in the year 1667 or 1668 [1078 H]. Arabic. 160 folios. Dimensions 23.3 x 13.5 cm; text area 17.8 x 8.4 cm; 24 lines per page. The title is given on fol. 1b line 3 and also in the colophon (fol. 160b line 3). The author's name is given at the start of the text (fol. 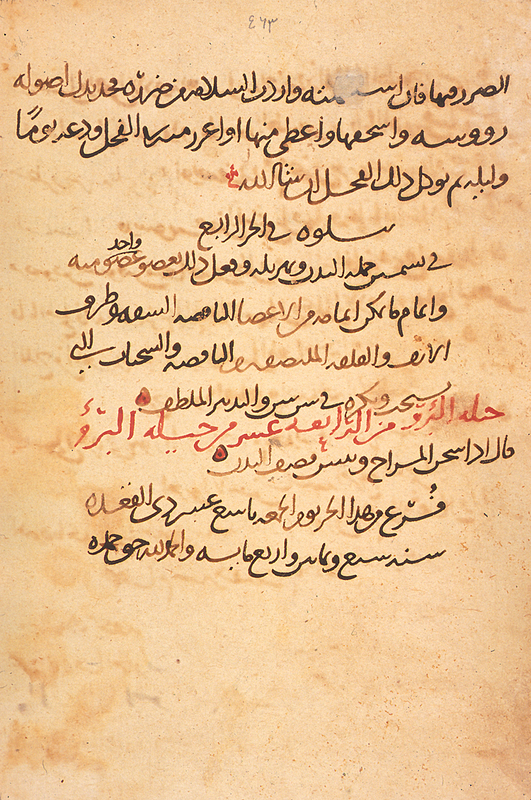 1b line 2) as Abū Bakr Muḥammad ibn Zakarīyā’ al-mutatabbib (the physician) al-Rāzī, and in the colophon (fol. 160b line 3) as Muḥammad ibn Zakarīyā’ al-Rāzī. The dedication to Abū Salih Mansur ibn Isḥāq is given on fol. 1b line 3. The copy is dated in the colophon (fol. 160b, lines 5-7), where it is said that the copyist Ḥakīm Muḥammad Riḍā ibn Muḥammad Mu’akhkhir Hamdānī completed it in the year 1667-8 [1078 H]. A complete copy. The text is written in at least two different hands. The majority of the text is written in a nasta‘liq. Fols. 106-110 are written in a more elegant naskh with some ta‘liq characteristics with only 21 lines per page. The text area has been frame-ruled. Black ink with headings in red. Red overlinings and red marginal headings have been added by a later hand. There are catchwords. Some folios have Arabic numerals in a later hand; the volume has been recently refoliated. There are marginalia in several hands, with notes indicating that the volume was collated against two other copies. One marginal annotation (fol. 56b) mentions a Muhammad Amin. At two places in the margins (fols. 58a and 114a [old 113a]) drug recipes are stated to be taken from the Kitāb Ghāyat al-itqān by Salih Efendi al-Halabi (that is, Ibn Sallūm), stated to be Chief of Physicians to Sultan Mehmet IV (who ruled from 1648-1687). For Ibn Sallūm's treatise, see the section below on Chemical Medicine. Another marginal note fol. 114a [old 113a] gives a recipe taken from the Kitāb al-Mukhtar [fī al-ṭibb] (The Book of Selections in Medicine) written by Ibn Hubal) in Mosul in 1165. The brown semi-glossy paper has neither laid lines or chain lines, though there is an indistinct vertical streaking to the paper. Some folios have been damaged and repaired; the edges have been trimmed from their original size. The volume is bound in pasteboards covered with brown leather. The covers have block-stamped medallions framed by a decorative tooled border. There are paper pastedowns and modern endpapers. Owner's stamps and signatures occur on fols. 1a and 160b. They include a stamp reading ‘Abd [Allāh] Muḥammad Amīn and dated 1165 H [= 1751-2]; this same owner's stamp occurs on another manuscript in the NLM collection, MS A 1.1. In the present manuscript, MS A 28, on fol. 1a there is a signature giving the name Muḥammad Amīn al-Mawṣilī, known as (al-shahīr bi-) Yāsīn Efendi, with a note beneath transferring the volume to his son ‘Abd Allah, whose stamp dated 1183 [= 1769-70] is impressed below. Muḥammad Amīn al-Mawṣilī is presumably the Muḥammad Amīn mentioned in the marginal note on fol. 65b. On both fol. 1a and 160b there is also another owner's stamp dated 1141 H [=1728-9], in addition to defaced stamps. On fol. 1b there is the signature and stamp of ‘Alī al-‘Umarī dated 1243 H [= 1827-8]. The volume was purchased by the Army Medical Library in 1941 from A.S. Yahuda, who acquired it from a dealer in Baghdad (ELS no. 1667, Med. 47). Schullian/Sommer, Cat. of incun. & MSS., entry A28, p. 306. This general treatise on medical aphorisms was a late composition by al-Rāzī, for in it he refers to many of his earlier treatises. In addition to being titled Kitāb al-Murshid (The Guide), it was also sometimes titled Kitāb al-Fusul (The Book of Aphorisms). It has been suggested that this relatively short introduction to basic medical principles was intended as a lecture to students. 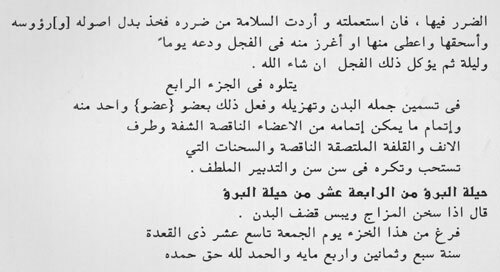 In the introduction, al-Rāzī says that because of misunderstanding and confusion regarding the aphorisms of Hippocrates, he has composed new medical aphorisms which could serve as an introduction to the medical art and a guide for students. The basic principles underlying the medical art and humoral pathology and physiology are presented in the form of 377 aphorisms grouped into 37 chapters. The treatise does not appear to have been translated into Latin. For other copies of the treatise, see Ullmann, Medizin, p. 134-5, and Sezgin GAS III, p. 284 no. 7. The treatise has been edited and published by A.Z. 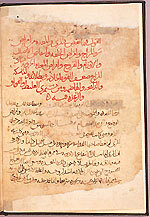 Iskandar, "Kitab al-Murshid wa-al-fusul li-Abi Bakr Muhammad ibn Zakariya' al-Rāzī", Revue de l'Institut des Manuscrits Arabes, vol. 7 (1961), p. 1-125. The opening of the treatise on medical aphorisms by al-Rāzī titled Kitāb al-Murshid (The Guide). The manuscript itself is undated, but the appearance of the paper, ink, and handwriting suggests a date of about 1800. The text is written in a medium-small, widely-spaced, careful and consistent naskh script. The script is awkwardly formed and probably written in North Africa. Black ink. Spaces have been left for rubrications, but only a few were filled in. The ivory, lightly-glossed paper is fairly stiff. It has laid lines, single chain lines, and is watermarked (initials A D). The volume consists of 49 leaves. Fols. 47-49 are blank and of different paper from rest of volume. The volume has been bound with three other unrelated manuscripts. The volume is bound in a modern library binding of pasteboard covers and envelope flap covered with tan leather. There are modern paper pastedowns and endpapers. The manuscript was purchased in 1941 by the Army Medical Library from A.S. Yahuda (ELS 3329). The manuscript is bound together with three unrelated manuscripts: MS A 88/II, MS A 88/III, MS A 88/IV. The most sought after of all the compositions by al-Rāzī (Rhazes to Europeans) was his Comprehensive Book on Medicine (Kitāb al-Ḥāwī fī al-ṭibb). 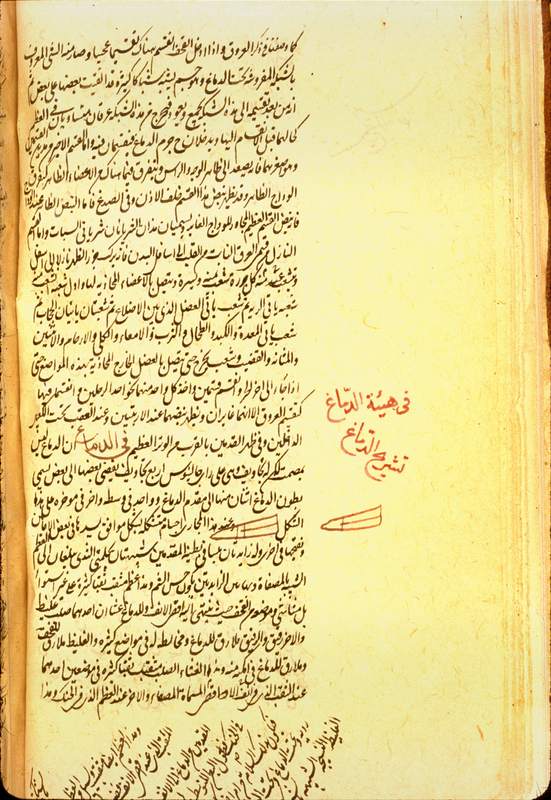 It was not a formal medical encyclopedia, but rather was assembled posthumously from Rāzī's working files of readings and personal observations. It was translated into Latin in 1279 under the title Continens by Faraj ben Salīm, a physician of Sicilian-Jewish origin employed by Charles of Anjou to translate medical works, and it had considerable influence in Europe as well as in the Islamic world. The Ḥāwī is essentially a large private notebook or commonplace book into which al-Rāzī placed extracts from earlier authors regarding diseases and therapies and also recorded interpretations and clinical cases from his own experience. Following al-Rāzī's death, Ibn al-‘Amid, a statesman and scholar appointed vizier to the Persian ruler Rukn al-Dawlah in 327/939, purchased from al-Rāzī's sister the notes comprising the Ḥāwī. He then arranged for the pupils of al-Rāzī to put the notes in order and make them available. The material comprising the Ḥāwī is arranged under headings of different diseases, with separate sections on pharmacological topics, corresponding to 23 volumes in the modern printing published in Hyderabad. Few complete copies are recorded. The National Library of Medicine is fortunate in having the oldest recorded copy of this treatise -- or rather part of the treatise, for the NLM manuscript contains only the section on gastrointestinal complaints. The unnamed scribe completed the copy on the 19th of the month of Dhu al-Qa‘dah in the year 487 of the Muslim era, which is equivalent to 30 November 1094. 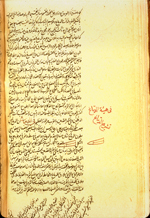 This manuscript is the oldest volume in the National Library of Medicine and the third oldest Arabic medical manuscript known to be preserved today. For other copies, see Sezgin GAS III, p. 278-280 no. 1; Ullmann, Medizin, p. 130, note 5; A.Z. Iskandar, A Study of al-Rāzī's Medical Writings with Selected Texts and English Translations (unpublished D.Phil. dissertation, University of Oxford, 1959); Savage-Smith, "Bodleian", MSS Bodl. Or. 561, Marsh 156, and Arab.b.10. 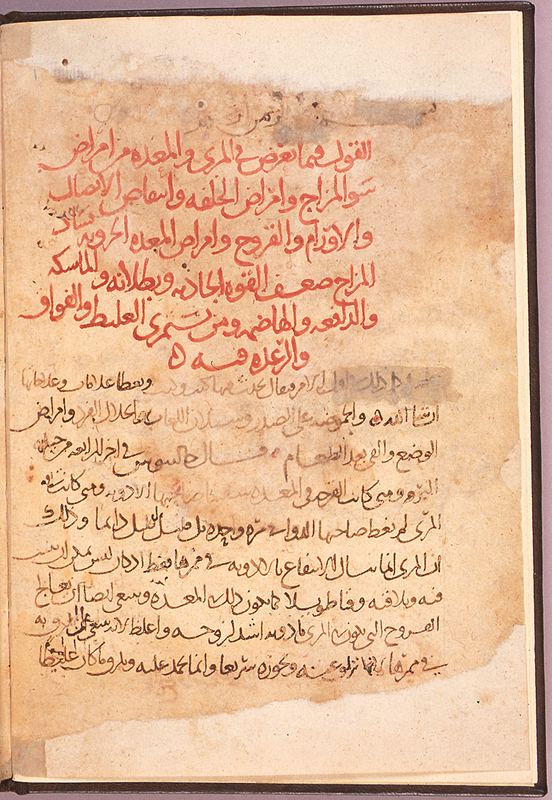 The Arabic text has been printed (using manuscripts in the Escorial library in Spain) as Abū Bakr Muḥammad ibn Zakarīyā’ al-Rāzī, Kitāb al-Ḥāwī fī al-ṭibb, 23 Parts (Hyderabad: Osmania Medical Publications, 1955-1985). The final page of the Hawi by al-Rāzī (Rhazes), with the colophon in which the unnamed scribe gives the date he completed the copy as Friday, the 19th of Dhu al-Qa‘dah in the year 487 [= 30 November 1094]. It is the oldest volume in the National Library of Medicine and the third oldest Arabic medical manuscript known to be preserved today. A transcription of the final page giving the colophon in which the scribe provided the date on which he finished the copy: 19 Dhu al-Qa‘dah 487, corresponding to AD 30 November 1094. 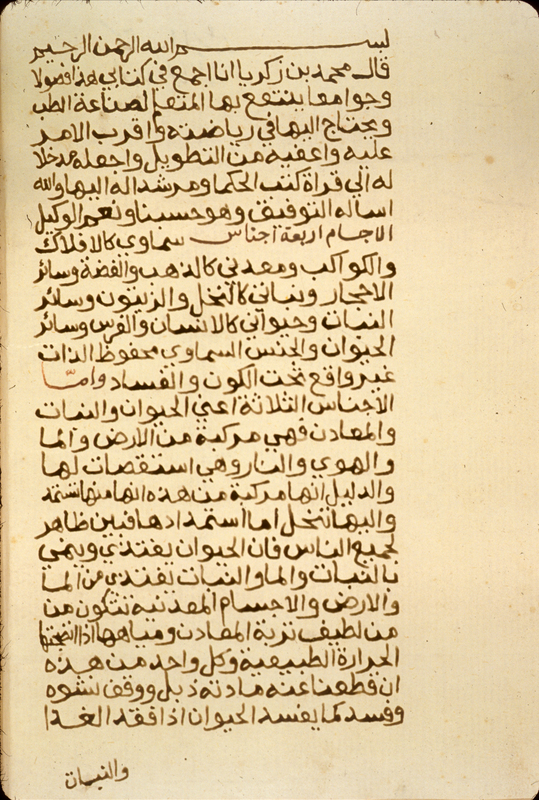 The section on gastrointestinal diseases from The Comprehensive Book on Medicine (Kitāb al-Ḥāwī fī al-ṭibb) by al-Rāzī. Copy completed on 30 November 1094 (19 Dhu al-Qa‘dah 487) by an unnamed scribe probably working in Baghdad. Arabic. 231 fol. Dimensions 29.1 x 20.5 cm; text area ca. 23 x 16 cm; 16-20 lines per page. 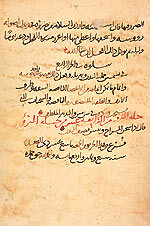 The title, Kitāb al-Ḥāwī fī al-ṭibb, is given on the title page (fol. 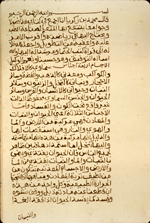 1a), where it is also said that this volume is the third section (al-juz' al-thalith) of the treatise. The other parts (juz's) making up the complete copy of the treatise transcribed by this scribe are now lost, and only this one remains. On the title page the author is given as Abū Bakr Muḥammad ibn Zakarīyā’ al-Rāzī. The copy was completed on 19 Dhu al-Qa‘dah 487 [= 30 November 1094] by an unnamed scribe. The colophon occurs on fol. 231b (old p. 463). It was possibly produced in Baghdad. The manuscript is incomplete, for it contains only the section on gastrointestinal diseases. The text corresponded to Parts V and VI (up to p. 160) of the printed Arabic edition Kitāb al-Ḥāwī fī al-ṭibb, 23 parts (Hyderabad: Osmania Medical Publications, 1955-1985). The text also corresponds to Liber 5 and Liber 6 of the Latin translation published in 1486, and later, under the title: Continens Rasis. In the present manuscript, MS A 17, fol. 221a [old p. 442], line 14, up to fol. 231b [old p. 463] do not correspond to any sections in the text printed in Hyderabad. The text is written in a medium-large to very-large rather cursive naskh script with minimal diacritical dots (some may have been added later). The letters ha' and ‘ayn only occasionally have a minuscule letter underneath, and the kaf is often missing the top stroke; a number of ligatures occur. There are no catchwords. Brown ink fading to a lighter shade, with headings in red and text-stops indicated by a red circle enclosing a dot. There has been some later re-inking (for example, the heading in red on fol. 1b (old p. 1) or the top righthand corner of text on fol. 5b (old p. 9). There are marginal corrections and conjectural readings in several hands, some of them possibly by the unnamed scribe. There are also later pencilled marginal notes giving correspondences between Arabic and Latin texts. The Latin text being referred to is apparently Continens Rasis...En tibi Liber quem in medicinia edidit Abuchare filius Zacharie Rasis...Hunc Helchauy, hoc est Continentum appelauit: quia omnem fere medicinalem artem contineret. In eo enim quecunque a priscis illis, tam grecis quam arabibus auctoribus annotatu digna in medicina sunt sparsim conscripta collecta congestaque in vnum comperies...Habebis nunc emendatissimum... (Venice, 1529), for in the copy of this book now in the collections at NLM there are pencilled annotations in the margins of books 5 & 6 (Liber quintus and Liber sextus, on fols. 93b-133b), giving the [old] page numbers in NLM MS A 17 which have the corresponding Arabic text. The almost matte-finish, fairly opaque, brown paper has unevenly dispersed fibers with scattered large inclusions and occasional thin patches. It has sagging, vertical laid lines but no chain lines. The paper has been partially damaged by damp, and the pages have been trimmed from their original size, so that some marginalia has been cut off. Fol. 1 has been conserved and covered with tissue; on many leaves there are worm holes that have been repaired, and the edges of many of the folios have been repaired. The volume is constructed of 24 quires of ten-leaves each (except for the 4th quire beginning with fol. 30, which has 12 instead of 20 folios). Originally the upper corner of the first leaf of each quire was labeled, spelling out the number of the quire in words; with trimming, most of these words have now been cut off and only a few traces can now be seen (for example, on fols. 142a, 152a, 172a and 192a). Each quire consisted of 5 bi-folios stacked one upon another, providing 10 leaves on which the text could be entered. The quire signatures were numbered internally -- that is, the first leaf of each quire was also given a series of three numerals, the first indicating the number of the leaf, the second indicating the number of the quire to which it belonged and the third indicating the number of the section or volume (juz' ) of the copy of which the quire formed a part. The title page (fol. 1a) states that this volume is the third section (juz' ) of the copy of the treatise. Consequently, on the top of fol. 72a (old p. 142) there can still be read the Arabic phrase meaning "1 of 8 of 3", which indicates that it is the 1st folio of the 8th quire of the 3rd juz'. On fol. 75a (old p. 148) there is written (in Arabic) "4 of 8 of 3", indicating that it is the fourth folio in the same quire, and on fol. 76a (old p. 150) it states that it is the 5th folio of the 8th quire of the 3rd juz'. The remaining five leaves of the 10-leaf quire do not have any numbers, since they are bi-folios, each connected physically with one of the numbered folios -- that is, the 6th is connected to the 5th folio, the 7th with the 4th, the 8th with the 3rd, the 9th with the 2nd, and the 10th with the 1st. In this present manuscript, the majority of the quire numberings are now illegible or lost when the pages were trimmed for rebinding, but enough remains to determine the sequence. For some reason, two extra folios (that is, one bi-folio) were placed, probably by mistake, in the 4th quire, which begins with fol. 30, so that the 5th quire begins with fol. 42, the 6th then begins with fol. 52, and the quires proceed by ten folios until the end of the volume. The volume consists of 232 leaves; fol. 232 is blank. The volume was fairly recently paginated as 436 pages (beginning with the verso of the first folio) using Arabic numerals, though numbers 321 and 326 were omitted in the paginations. The volume has been recently foliated. The volume is bound in an Army Medical Library modern binding of brown leather over pasteboards. There are modern pastedowns and endpapers. The volume has been placed in specially prepared box, having an exterior design providing a modern interpretation of a traditional Islamic tooled decorations often found on medieval bindings. On the title page (fol. 1a) there is an owner's note, mostly obliterated, in which the last two numerals of a date are readable as "34", with the preceding numeral possibly being an 8; if this is a correct reading, then the year 834 would equal 1430-31. The owner's name is not legible. The volume was purchased in 1941 by the Army Medical Library from A.S. Yahuda, who acquired it in An Najaf in Iraq, where it was said to have been in the possession of the same family for six centuries (ELS No. 1621). Schullian/Sommer, Cat. of incun. & MSS., entry A17, p. 302-3 and Plate 10 (illustrating fol. 186b).